I think you’ve all read the post where I talked about all the things I expected from Marvel’s latest release, Captain America: Civil War. Of course, I watched Civil War shortly after and here’s what I thought about it. Spoiler warning? Spoiler warning. First of all, I loved each and every character and the screen time they got, whether it was Spider-man (he was adorable okay), Ant-Man (basically the adult Team Cap version of Spider-man), Hawkeye (golf champion), Wanda (super OP and probably could be a team all on her own), Black Widow (she’s literally everywhere and doesn’t have her own movie yet), Black Panther (prince turned king who does whatever he likes), Vision (like an iPod human, but possibly less annoying). And we can’t forget the main characters, right? Captain America (everyone’s favorite blond american patriot), Bucky Barnes (confuzzled winter soldier with a COOL METAL ARM) and Iron Man (he seems to be spiraling further into the darkness with each new movie). So regardless to say, I really enjoyed watching all the characters and Civil War was overall a fantastic movie. But of course, there’s always a couple of things that bothered me a little. For example: why does Black Panther get to do whatever he wants? I’m not complaining, really, but if my king was running around in a foreign country, chasing after modified humans while trying to get the guy who apparently murdered the last king, I’d have a lot of problems. First off, who’s running the country? Why’re they all okay with this?? What if the guy who killed the old king kills the new king too? Did anyone think of that!! Secondly, why did Hawkeye join Captain America. Was he not thinking about what it meant, going against higher authority? What’s going to happen to his wife and kids! I guess Natasha would have to baby-sit them 24/7. Also, who’s to stop the general (who put Team Captain into a high security prison in the middle of the ocean!!) from using Hawkeye’s family as a bargaining chip? Like, I seriously doubt they’d have a problem doing it, even if Natasha and Tony Stark put their foot down on that. Thirdly, the main antagonist. How come he went around, finding a link between Bucky Barnes and Tony Stark and Tony Stark couldn’t do that? Yes, I get it, Iron Man wasn’t in Captain America: The Winter Soldier, but y’know, considering that the media was talking about a terrorist blowing up a building and killing the king of Wakanda, you’d do a background check or something? What’s the deal with Tony Stark and Pepper Potts anyway. Steve Rogers needs to fix his wonky polygonal relationships. I do not approve of him and the blond girl who was in the secret government organization. He basically used her to get all this high security information. I was half-expecting her to be found out and thrown out of her job every time she showed up on the screen. Especially after the “do what you think is right” speech she gave at the funeral, considering that when you go against the government, trying to do the right thing, you’re either ostracized and fired, or thrown in jail. So the cynical side of me was very sure this was going to happen, but it didn’t. So hooray I guess BUT THAT DOESN’T MEAN IT WASN’T DANGEROUS. And last but not least, doesn’t anyone care about Tony Stark. Last we left him in the Iron Man series, he was suffering from PTSD, built a ton of robots obsessively, was compulsive, lost his house and seemed to have mini-break downs every now and then. Moving on to the last Avengers: Age of Ultron, Tony Stark builds an AI who ends up being quite powerful and decides that a meteor was needed to help earth evolve. He shifts from building a ton of suits for himself, to building a program designed to secure earth for him. That kind of sounds like Tony Stark saying “uh, guys I don’t think I can fight that much anymore, y’know all the dangerous things we do and dangerous things I did, it’s kind of giving me PTSD so I’m sort of building this AI that will help so I don’t have to go out and keep doing things and seeing things that can trigger my PTSD” but of course, this plan BACKFIRES and he’s ultimately created a sentient, malevolent being who thinks, in all honesty, it’s doing the right thing. Now fast forward back to the present. Look who else is thinking they’re doing the right thing and in the process, kind of blowing up a building by accident by giving Wanda (a kid, by his own words) the clearance to go into a foreign country on a secret mission. It’s really understandable, the way Tony seems to be unhitched, off balance most of the movie, especially with the conclusion that his parents had been targeted and killed by Bucky. That’s all great story telling, right, but why isn’t Tony’s mental health being dealt with? I sincerely doubt blowing up all your suits means that you’re A-OK with what happened in your past. And Tony is clearly not okay with anything. Iron Man needs some mental therapy, stat, and it better not be Bruce Banner, writes Dr. Kanra on his file and mails it to the Avengers. 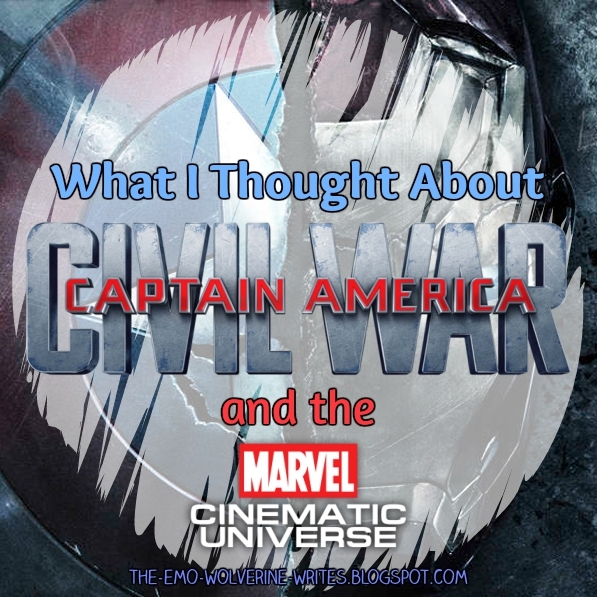 So those were my thoughts about Captain America: Civil War. What did you think about the movie? Is This Baby The Right Size?